Foxborough Sign Bylaw Revision - Community Opportunities Group, Inc.
Community Opportunities Group, Inc. prepared a new non-zoning sign-bylaw for the Town of Foxborough that incorporates current best practices and sign technologies, while balancing the needs of business owners and residents. The sign regulations seek to appropriately and fairly address the signage needs for different physical typologies and land uses through the implementation of dimensional requirements and design guidelines. It also addresses procedural issues that resulted from its removal from the Zoning Bylaw and addition into Foxborough’s General Bylaws. The revised bylaw passed at the Special Fall Town Meeting in 2014. 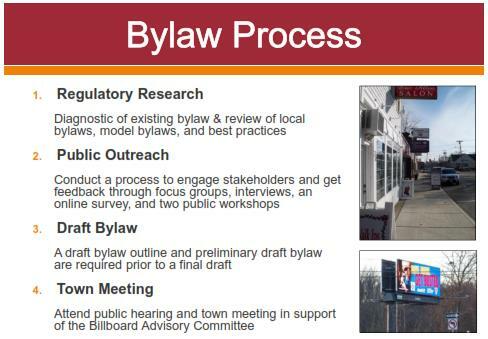 The process included public and stakeholder input through a series of interviews, focus groups, workshops, and an online survey, all part of a strategy to help shape and build support for a bylaw that is clear and user-friendly, and which reflects the values and vision of Foxborough’s residents and business owners.